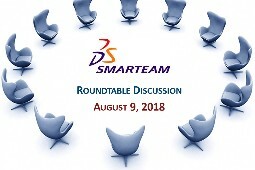 Recently, xLM Solutions moderated a roundtable discussion about SmarTeam among current SmarTeam users. We discussed what’s next for SmarTeam and looked at the process for moving from SmarTeam to the 3DEXPERIENCE platform. From what we have heard, Dassault Systèmes will continue to support SmarTeam for the foreseeable future. It is based on a V5 platform just like CATIA V5, so as long as DS supports CATIA V5, it will also support SmarTeam. When it’s time to suspend support of SmarTeam, it will likely happen in phases, with paid extended support available for a period of time. DS will give plenty of notice to users when it’s time to suspend support for SmarTeam. The bottom line is that SmarTeam users need not rush to migrate off SmarTeam but should keep in mind that it is based on older technology that will someday be replaced by newer technology. SmarTeam is a mature product, meaning it is well-tested and used by thousands of users, without too many expected changes in functions or features. When users decide to investigate a new system, it’s a good time to review business processes, understand how your business is truly operating and look for the best match to meet your needs. There is a migration path from SmarTeam to the 3DEXPERIENCE platform, with technologies and methods already in place to move data from SmarTeam to the 3DEXPERIENCE platform. For those users already working with the DS product line, including CATIA or SOLIDWORKS, 3DEXPERIENCE will be an excellent fit. For non-CAD specific or a competitor’s CAD users, we suggest that you also consider 3DEXPERIENCE. Users will want to understand if a new system can do what they need it to do and fully grasp how to get the data out of their current system into a new system. It can be a large undertaking to make sure a new system supports the special functionality you have in your current system. It is an important task to document the key requirements required for the new system and understand how the requirements will be met. In the roundtable, we also discussed migration of legacy data. Migrating customer specific data, which can include CAD data, meta data associated with CAD data, engineering change data, bill of materials data, and non-CAD data including test backs, lab reports, and marketing data, can be a complex project. In a data migration process, we identify which data is needed in the new system and which data can be purged. We can migrate all of the data you need, whether it is in SmarTeam or found on spreadsheets. We also discussed the following topics during the roundtable. xLM Solutions is an unbiased consultant team that can help SmarTeam users evaluate their options and decide on a proper course of action. We’ve worked closely with SmarTeam users over the years and understand the requirements and needs for data migration projects and how to choose a new system. It can be a major undertaking to make sure a new system supports the special functionality and customizations of your current system. All projects of this nature require significant time to plan, test, and validate and to identify which functions work directly out of the box and which processes need customizations. In our experience, depending on the complexity of the project, moving to a new system can take at least a year to execute. xLM Solutions has worked with many customers migrating data from SmarTeam to the 3DEXPERIENCE platform. We understand that every customer will have different priorities and requirements. Working with an independent consultant with extensive experience makes for a smoother process. One customer, for example, had a significant amount of customization in its SmarTeam implementation. As this customer started using 3DEXPERIENCE, we were able to remove about a half of the customizations because the new system could handle the company’s processes directly out of the box. The customer later added customizations to 3DEXPERIENCE to fit its unique needs and expand the solution into other areas. Another customer had very few customizations in its use of SmarTeam but as we migrated from SmarTeam to the 3DEXPERIENCE platform, we added customizations relating to CAD mapping to match its previous use of SmarTeam. We had a recent data migration customer with over one million documents in SmarTeam plus data from its ERP system. Over about 18 months, our team worked to identify any functionality gaps and coordinate the data migration – the entire project took a couple migration cycles to get to the desired goal. This customer also required expanded BOM management processes and so the customer decided to migrate from SmarTeam to the 3DEXPERIENCE platform because it had better method to synch with ERP data. As the customer expanded its operations, it added more 3DEXPERIENCE modules, for example, for quality and project management. Another customer that was implementing multi-site SmarTeam with locations across the globe found that it was more strategic to deploy and implement a single system with a single database across all locations. The first is a baseline package that is a pre-configured system. It is, by-and-large, going to be up and running directly out of the box, while still allowing for customer specific configurations and customizations. The second flavor is a “customer specific environment” (CSE) package. It is an open system that allows for any amount of customization and configuration. 3DEXPERIENCE has a single database and is a three-tiered system: the client connects to the web server which connects to the database. Where SmarTeam has “vaults,” 3DEXPERIENCE has “stores” where files are stored. It allows for replicated stores in various locations around the world, wherever your engineers are working. Users can copy the local file but it is always connected to the central database. Are you considering moving from SmarTeam to the 3DEXPERIENCE platform? Are you interested in discovering options of what you can or should be doing with your SmarTeam system? Are you looking for more info on 3DEXPERIENCE? Contact xLM Solutions for expert information and guidance.